Many of you fabulous teachers have parent/teacher conferences coming up, and this is a great time to make some very important connections with parents. 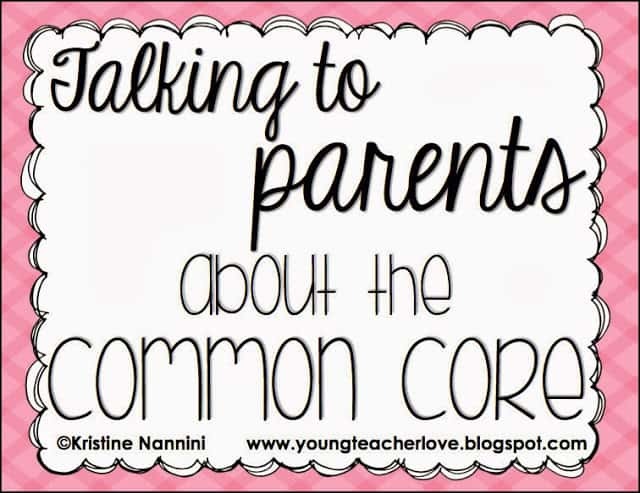 A question I receive quite often is, “How do you explain the Common Core Standards to parents?” That’s such a great question! 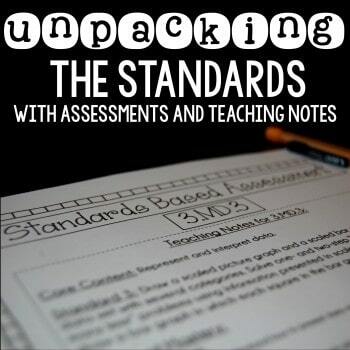 Let’s face it, reading the standards isn’t like reading a novel for pleasure. Many of us get so busy trying to understand the standards, that we forget one of our important roles in making this implementation stick is helping our parents understand it, too. 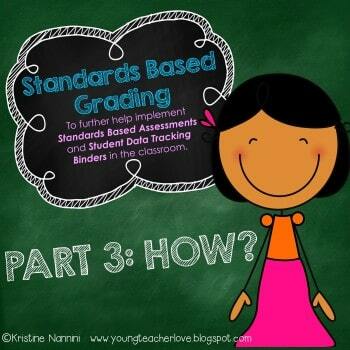 The standards are here to stay, so it’s important that we are all on board. 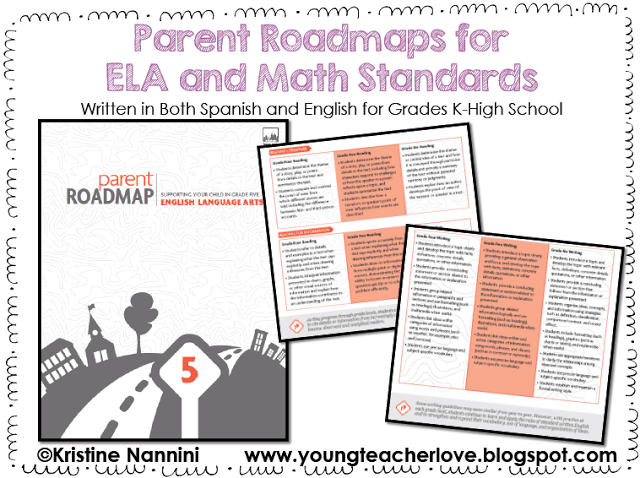 I’ve scoured the internet to find, what I believe, are some of the best resources for informing parents of the standards. First up are some phenomenal videos that are super easy to understand. I recommend playing these at an open house, parent-teacher conference, or at an informational meeting night. You can even put the video on repeat on a large projector or a small TV screen at the entrance to your school. That way, as parents enter the building, they can watch these quick videos. The first video gives a great explanation of the Common Core Standards. The author of the video gives permission to use this video any way you would like. This means you can even add it to your district’s website! This next video is a quick 30 second Public Service Announcement that was developed by the Council of the Great City Schools to increase public awareness and engagement of the Common Core State Standards. Next are some easy-to-understand printable flyers for parents. They are written for both English Language Arts and Math for grades kindergarten through high school, include an additional Spanish version (for those ELL families). They can even be printed in both black and white and color! 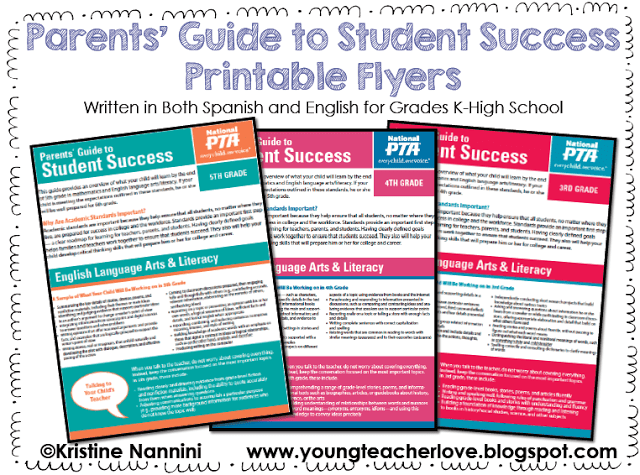 These Parents’ Guide to Student Success Printable Flyers provide an organized overview of what your child will learn by the end of their academic year in both math and English language arts/literacy. Click here for the color versions, and click here for the black and white versions. 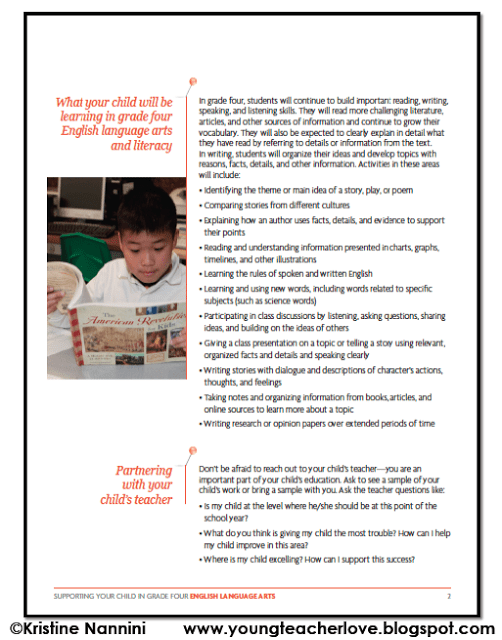 These phenomenal resources provide guidance to parents about what their children will be learning and how they can support that learning in grades K-8. 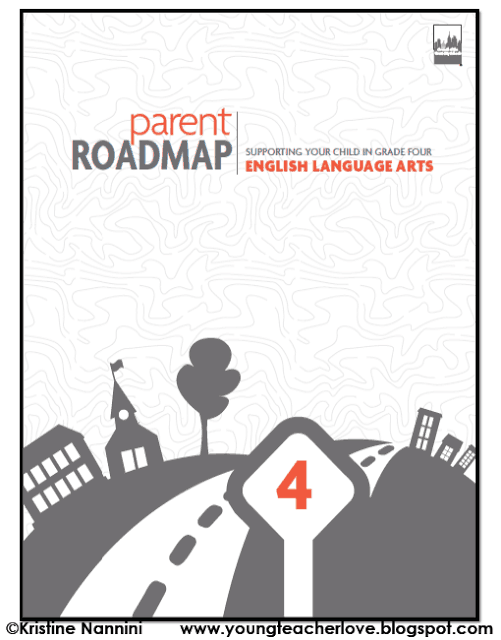 These Parent Roadmaps for each grade level also provide three-year snapshots showing how selected standards progress from year to year so that students will be college and career ready. 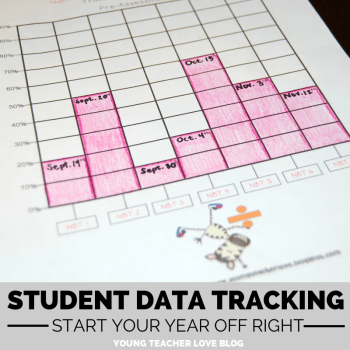 Personally, this is my favorite part, because it’s also super helpful for teachers! 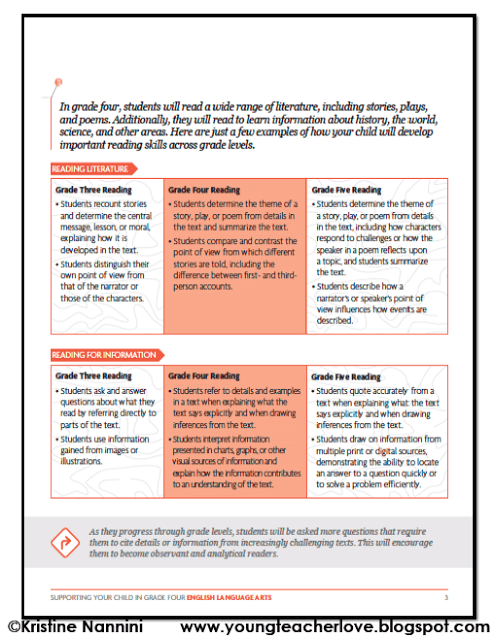 Click here to grab all grade levels. The website that created these documents gives you permission to post these PDFs online, as long as you are posting for non-commercial use, and give them credit. This means, you can post these PDFs on your school district’s website for parents and families to view! 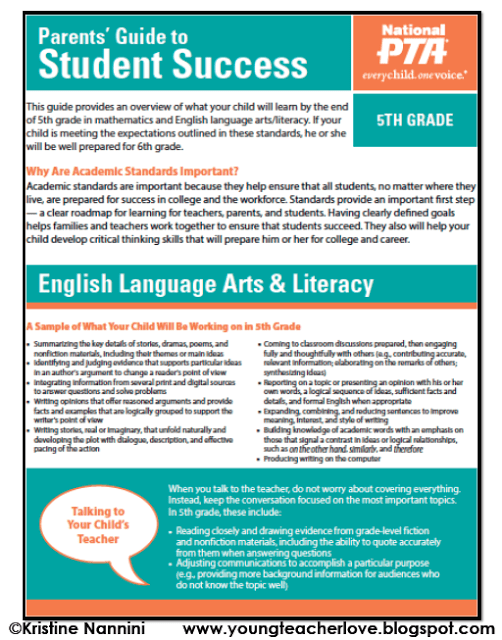 The videos, printable flyers, and parent roadmaps don’t even scratch the surface of phenomenal materials for informing parents about the Common Core Standards. Below are some links to additional resources. Simply click on the text to be directed to each document or website. These are great.Thanks for sharing! Thanks Courtney! I’m glad you can use them! 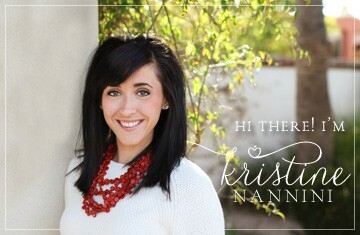 Thanks Kristine. I had the flyers, but not the videos and they are great! You are very welcome! I thought so too! You’re so sweet Kristen!! Thank you! I’m so glad my data binders helped! :) It’s so crazy how late our conferences are here! I didn’t realize we were one of the last! Hope yours went well! Have a great week! I can’t get the videos to show. What program do I need? Thank you so much for this stuff! We are actually having a parent meeting tonight! Love all of your stuff! Thank you so much!